Powers: He has a measure of Superhuman strength though not as much as Savage Dragon. Before his death he was transfused with Savage Dragon’s blood and gained strength equal to his foe. 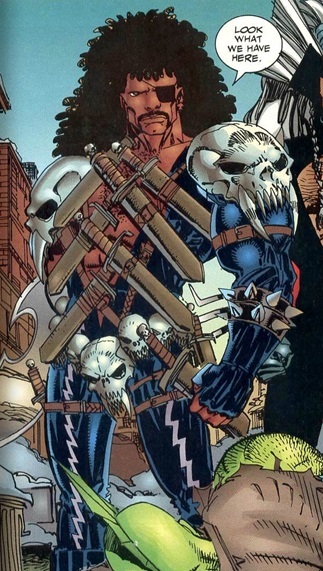 Often partnered with Hellrazor he made his first appearance as a member of the Viscous Circle attacking a recovering Savage Dragon after he was defeated and impaled by Overlord. Their plan was to finish him off for their boss but he had his leg broken and before escaping with his partner [Savage Dragon #8]. He shows up next on the verge of killing a bartender. Savage Dragon shows up and quickly kills him and he’s carted off to jail [Savage Dragon #10]. He appears again in a failed prison escape [Savage Dragon #26]. Finally escaping from prison he is defeated by She Dragon in battle [Savage Dragon #46]. After the death of Dragon’s wife, he and a handful of criminals attacked the hero and he was again defeated [Savage Dragon #63]. Seemingly betraying the viscous circle, he and his girlfriend were kicked out [Savage Dragon #114]. Captured and used as guinea pigs by the viscous circle they were infused with Savage Dragon’s blood but yet again were defeated. While in the hospital they both exploded leaving their son an orphan [Savage Dragon #155].